Patron God of war, hunting, and soldiers. In early Egyptian mythology, Anhur (also spelled Onuris, Onouris, An-Her, Anhuret, Han-Her, Inhert) was originally a foreign god of war, who started being worshipped in the Egyptian area of Abydos, and particularly in Thinis, during the 11th dynasty. Myths told that he had brought his wife, Menhit, who was his female counterpart, from Nubia, and his name reflects this - it means (one who) leads back the distant one. One of his titles was Slayer of Enemies. 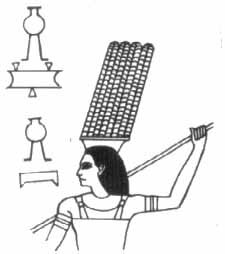 Anhur was depicted as a bearded man wearing a robe and a headdress with four feathers, holding a spear or lance, or occasionally as a lion-headed god (representing strength and power). In some depictions, the robe was more similar to a kilt. Due to his position as a war god, he was patron of the ancient Egyptian army, and the personification of royal warriors. Indeed, at festivals honoring him, mock battles were staged. During the Roman era the Emperor Tiberius was depicted on the walls of Egyptian temples wearing the distinctive four-plumed crown of Anhur. Because Anhur's name also could mean Sky Bearer, and due to the shared headdress, Anhur was later identified as Shu, becoming Anhur-Shu. Since Anhur was the more popular and significant deity, and, indeed, Shu was more a concept than a god, Shu was eventually absorbed completely into Anhur. In the New Kingdom, his popularity increased and Anhur was also titled Saviour, becoming to the people their deliverer from human burden, due to their view of war as their source of freedom and victory. The aspects of war, and saviour, shared with Horus, contributed to Anhur's eventual identification with the much greater Horus. During the Egyptian period of dominance over Nubia, the Kushites named Horus-Anhur as Arensnuphis (also Arsnuphis, Harensnuphis), Ari-hes-nefer in Egyptian, meaning something along the lines of Horus of the beautiful house. Consequently once Osiris became identified as an aspect of Horus (and vice-versa), Arensnuphis was viewed as having Isis as his wife.